The Saturn V, S-II Stage in the test stand. 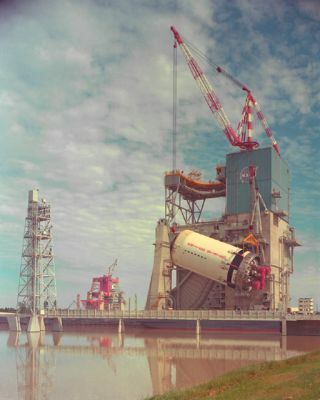 In this historical photo from the U.S. space agency, the S-II stage of the Saturn V rocket is hoisted onto the A-2 test stand in January of 1967 at the Mississippi Test Facility, now the Stennis Space Center. This was the second stage of the 364-foot tall Moon rocket. The second stage was powered by five J-2 engines.